I find myself admitting all the time during my book reviews and I have to make another confession – I love things that make me laugh, even if they are sometimes in bad taste. 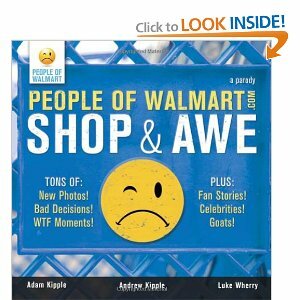 When I had the chance to read and review People of Walmart: Shop & Awe by Adam Kipple, Andrew Kipple and Luke Wherry, I thought it would be one of those moments where I’d laugh in spite of myself. I was right! This book is based on entries from the website . I’d never been to the website so I didn’t actually realize what I would find when I opened the book. I opened the book to find some of THE funniest photos I’d ever seen – all taken within the confines of Walmart stores and parking lots! Along with these photos were incredibly hilarious (albeit sometimes distasteful) captions to go along with the photos. As well, there were some truly laugh-out-loud Walmart-based stories interspersed throughout the book. Some photos were funny, some made me cringe and some made me feel a bit nauseous – but, I’m a bit embarrassed to admit – they all made me laugh! I thought this book was truly funny! Though I don’t think this type of humour is for everyone, I really did enjoy this book! If anyone is looking for me, I’m probably off checking out the People of Walmart website! I’ve seen some of the photos on the net… I almost fall out of the chair laughing every time. Sorry folks, but Wal-Mart shoppers are jokes. I’m a Walmart shopper although I’ve never seen anyone quite as entertaining as some of those photos on the web (which always make me laugh). Makes me want to carry my camera around when I shop (since I’m too old to have a camera phone :o). I just may have to get this book! I love their website and I’m so excited that they made a book. It always cracks me up! Glad you liked it too!!!! I like it! I like it a lot. You know exactly what youre talking about, exactly where other people are coming from on this issue. Im glad that I had the fortune to stumble across your blog. Its definitely an essential issue that not sufficient individuals are talking about and Im glad that I got the chance to see all the angles. The people of wal-mart is a hilarious website. I seem to always notice the strangest people when I go down the laundry and household care isle. Next time, perhaps I will take some pictures.